"MP4" redirects here. For other uses, see MP4 (disambiguation). MPEG-4 Part 14 extends over ISO Base Media File Format (MPEG-4 Part 12). MPEG-4 Part 14 or MP4 is a digital multimedia container format most commonly used to store video and audio, but it can also be used to store other data such as subtitles and still images. Like most modern container formats, it allows streaming over the Internet. The only official filename extension for MPEG-4 Part 14 files is .mp4. MPEG-4 Part 14 (formally ISO/IEC 14496-14:2003) is a standard specified as a part of MPEG-4. Portable media players are sometimes advertised as "MP4 Players", although some are simply MP3 Players that also play AMV video or some other video format, and do not necessarily play the MPEG-4 Part 14 format. MPEG-4 Part 14 is an instance of the more general ISO/IEC 14496-12:2004 (MPEG-4 Part 12: ISO base media file format) which is directly based upon the QuickTime File Format. MPEG-4 Part 14 is essentially identical to the QuickTime file format, but formally specifies support for Initial Object Descriptors (IOD) and other MPEG features. MPEG-4 Part 14 revises and completely replaces Clause 13 of ISO/IEC 14496-1 (MPEG-4 Part 1: Systems), in which the file format for MPEG-4 content was previously specified. The MPEG-4 file format specification was based on the QuickTime format specification published in 2001. The MPEG-4 file format, version 1 was published in 2001 as ISO/IEC 14496-1:2001, which is a revision of the MPEG-4 Part 1: Systems specification published in 1999 (ISO/IEC 14496-1:1999). In 2003, the first version of the MP4 file format was revised and replaced by MPEG-4 Part 14: MP4 file format (ISO/IEC 14496-14:2003), commonly named as MPEG-4 file format version 2. The MP4 file format was generalized into the ISO Base Media File format ISO/IEC 14496-12:2004, which defines a general structure for time-based media files. It in turn is used as the basis for other file formats in the family (for example MP4, 3GP, Motion JPEG 2000). The MP4 file format defined some extensions over the ISO Base Media File Format to support MPEG-4 visual/audio codecs and various MPEG-4 Systems features such as object descriptors and scene descriptions. Some of these extensions are also used by other formats based on ISO base media file format (e.g. 3GP). A list of all registered extensions for ISO Base Media File Format is published on the official registration authority website. The registration authority for code-points (identifier values) in "MP4 Family" files is Apple Inc. and it is named in Annex D (informative) in MPEG-4 Part 12. Codec designers should register the codes they invent, but the registration is not mandatory and some invented and used code-points are not registered. When someone is creating a new specification derived from the ISO Base Media File Format, all the existing specifications should be used both as examples and a source of definitions and technology. If an existing specification already covers how a particular media type is stored in the file format (e.g. MPEG-4 audio or video in MP4), that definition should be used and a new one should not be invented. MPEG-4 files with audio and video generally use the standard .mp4 extension. Audio-only MPEG-4 files generally have a .m4a extension. This is especially true of unprotected content. MPEG-4 files with audio streams encrypted by FairPlay Digital Rights Management as were sold through the iTunes Store use the .m4p extension. iTunes Plus tracks, that the iTunes Store currently sells, are unencrypted and use .m4a accordingly. Audiobook and podcast files, which also contain metadata including chapter markers, images, and hyperlinks, can use the extension .m4a, but more commonly use the .m4b extension. An .m4a audio file cannot "bookmark" (remember the last listening spot), whereas .m4b extension files can. The Apple iPhone uses MPEG-4 audio for its ringtones but uses the .m4r extension rather than the .m4a extension. Raw MPEG-4 Visual bitstreams are named .m4v but this extension is also sometimes used for video in MP4 container format. Mobile phones use 3GP, an implementation of MPEG-4 Part 12 (a.k.a. MPEG-4/JPEG2000 ISO Base Media file format), similar to MP4. It uses .3gp and .3g2 extensions. These files also store non-MPEG-4 data (H.263, AMR, TX3G). In practice, most (if not all) low end phones and feature phones record in this format, as most (if not all) other mobile phones and smartphones record MP4 files using the .mp4 file extension, and some high end phones can record in .raw. M4A stands for MPEG 4 Audio and is a filename extension used to represent audio files. Some file managers, such as Windows Explorer, look up the media type and associated applications of a file based on its filename extension. But because MPEG-4 Part 14 is a container format, MPEG-4 files may contain any number of audio, video, and even subtitle streams, therefore it is impossible to determine the type of streams in an MPEG-4 file based on its filename extension alone. In response, Apple Inc. started using the .m4a filename extension for MP4 containers with audio data in the lossy Advanced Audio Coding (AAC) or its own Apple Lossless (ALAC) formats. Software capable of audio/video playback should recognize files with either .m4a or .mp4 filename extensions, as would be expected, because there are no file format differences between the two. Most software capable of creating MPEG-4 audio will allow the user to choose the filename extension of the created MPEG-4 files. Subtitles: MPEG-4 Timed Text (also known as 3GPP Timed Text). MP4 files can contain metadata as defined by the format standard, and in addition, can contain Extensible Metadata Platform (XMP) metadata. ^ a b 3GPP2 (18 May 2007). "3GPP2 C.S0050-B Version 1.0, 3GPP2 File Formats for Multimedia Services" (PDF). 3GPP2: 67, 68. Archived from the original (PDF) on 7 October 2009. Retrieved 2009-06-12. ^ a b mp4ra.org - MP4 Registration authority. "References, MPEG-4 Registration authority". Retrieved 2018-08-29. ^ ISO (April 2006). "ISO Base Media File Format white paper - Proposal". archive.org. Archived from the original on 2008-07-14. Retrieved 2009-12-26. ^ ISO (October 2005). "MPEG-4 File Formats white paper - Proposal". archive.org. Archived from the original on 2008-01-15. Retrieved 2009-12-26. ^ ISO (October 2009). "ISO Base Media File Format white paper - Proposal". chiariglione.org. Retrieved 2014-10-31. ^ Apple Computer. "MPEG-4 Fact Sheet" (PDF). ^ International Organization for Standardization (2003). "MPEG-4 Part 14: MP4 file format; ISO/IEC 14496-14:2003". Retrieved 2009-06-11. ^ Apple Inc. (2001). "Classic Version of the QuickTime File Format Specification". Retrieved 2009-06-14. ^ Library of Congress (2001). 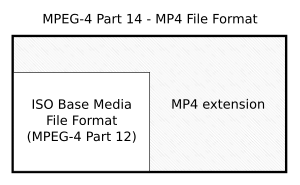 "MPEG-4 File Format, Version 1". Retrieved 2009-06-14. ^ Network Working Group (2006). "MIME Type Registration for MPEG-4". Retrieved 2009-06-14. ^ International Organization for Standardization (2001). "MPEG-4 Part 1: Systems; ISO/IEC 14496-1:2001". Retrieved 2009-06-11. ^ Library of Congress (2003). "MPEG-4 File Format, Version 2". Retrieved 2009-06-14. ^ "MPEG-4 Systems General Issues". chiariglione.org. July 2001. Retrieved 2010-04-11. ^ a b c ISO (2008). "ISO/IEC 14496-12:2008, Information technology -- Coding of audio-visual objects -- Part 12: ISO base media file format" (PDF). International Organization for Standardization: 88, 94. Retrieved 2009-05-30. ^ International Organization for Standardization (2004). "MPEG-4 Part 12: ISO base media file format; ISO/IEC 14496-12:2004". Retrieved 2009-06-11. ^ Steven Greenberg (2009). "Registration of ftyp's". Retrieved 2009-06-15. ^ Steven Greenberg (2009). "Complete List of all known MP4 / QuickTime 'ftyp' designations". Retrieved 2009-06-15. ^ mp4ra.org - MP4 Registration authority, Registered Types - Codecs - ISO Code Points, Retrieved on 2009-07-14. ^ Chapman, Nigel; Chapman, Jenny (2004). Digital multimedia (2. ed.). Chichester [u.a. ]: Wiley. ISBN 9780470858905. ^ "DataDistiller™ Engine". Digital Confidence Ltd. Retrieved 9 June 2014. MP4 metadata can contain various details about the file author, the software used in its creation, and the time and date in which it was created. The metadata can also be structured in XMP format.